The Elemental Energy of Earth is best felt by standing outside barefoot, wherever you wish: woods, beach, jungle, desert, field. If you can take the time to put your bare feet on our planet, you’re slowing down, touching nature, bearing weight on your bones, and on the solid ground. In the quiet, feel the low buzz of flora and fauna. Remember everything comes from the Earth. 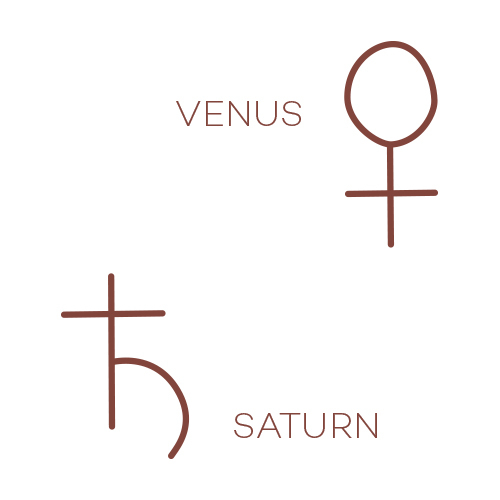 Planets signify a universal channel of energy represented by traditional archetypes. Earth planets are about our foundation and support. VENUS is the third brightest body in the sky. Beauty, harmony, and sociability live in Venus. SATURN is the planet with a belt . . . is it a tool belt? Representing orderliness, organization, and constriction, or just there in case you need a whuppin’. Astrological Signs are archetypes and an expression of elemental Earth energy at the core. Earth signs are practical and stable. TAURUS the bull loves to luxuriate on the grassy prairie and will endure anything to get there. VIRGO the maiden is a picture of purity, efficiency, and productivity. CAPRICORN the goat is unwavering in duty, following rules, and taking on responsibilities. The concept of Chakras is vast. Consider them vortices of color that spin energy through the bodies—both physical and subtle (energetic, emotional, spiritual.) Earth element in chakras is supportive and stabilizing. ANAHATA the heart chakra is the center of connection, love, and compassion for the self and others. MULADHARA the root chakra is the center of security, the physical senses, and connection to nature.